I received this book in the mail as part of a UK cover set from Egmont Books and I must say I prefer the English cover to the US one 😉 Gone throws a light on what would happen to the world if there were no adults and no accountability… starving children, bullies in the street, anarchy, rich kids against regular kids. As a reader you are pulled into a scene of chaos and wonder as teens and children fend for their lives against mutated forces of nature and residual nuclear fallout. You walk through the every day lives of each character as they search for an autistic brother, rescue a little girl from a burning building and cook food in an abandoned McDonald’s. I enjoyed the premise as well as the interaction between main boy Sam and smart girl Astrid. Super science fiction for young adults. Thanks again to Egmont for the thrilling read! That sounds like a really good book. One thats different!! I’ll have to get it for sure. Thanks for the great review! 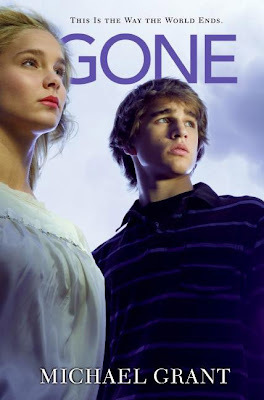 I enjoyed reading Gone. I thought it was a pretty good start to the series. Hunger was great too. I can’t wait for Lies to come out! If you email me your address you again you can borrow mine as part of the tour!